At a time in history when shopping malls and huge superstores did not exist, the international exhibitions were very impressive to those people who had never seen anything on that scale. We receive a great many emails from people who are puzzled by the pictures of medals shown on their pianofortes, some of which have realistic miniature reproductions of one side of a medal, flat on the back so that they can be fixed onto the piano. What they show us, mainly, is that the piano was made after the last exhibition that is listed. 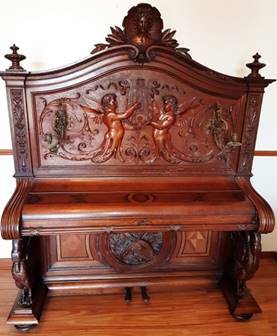 This information is often shown on hundreds or thousands of the pianos produced by that maker after the event, and it is only on very rare occasions that we find that the piano is the very instrument that was actually exhibited. Another form of confusion occurs when the piano is marked with the year the firm was established (German “gegrundet”) and it is for this reason that, for example, some people think that Irmler’s pianos were all made in 1818, or Werner’s pianos were all made in 1845, and choose to ignore the later years marked on various medals. As early as 1819, Erard received a medal at the Paris Exposition for his pianos, and many other pianofortes were awarded prize medals and awards at later exhibitions: these became important to the makers, but also to us looking back to learn more from a piano. The makers liked to show them off in the form of transfers or labels stuck inside, or in more obvious positions on the front. The medals are usually dated, and people often run away with the idea that this is the date of the piano, but the medals can only tell you that the piano was made in or after the latest year you can see. For example, no reliable dates of Hagspiel serial numbers are available, but the dates of medals shown on the piano may help. These include 1873, 1875, 1876, 1880, 1884, 1893 and 1897. If a Hagspiel piano shows the 1880 medal, but not the later ones, we can assume that the piano was made after the 1880 exhibition, but probably not as late as 1884. However, the medals sometimes reveal that published dates of serial numbers are incorrect, as in a Nelson piano supposedly made in 1907, although it mentions a 1909 medal. Makers usually showed both sides of the medals, with the result that they looked like twice as many. The pictures above perhaps give some idea how important it was for German makers to try to include medals on their nameplates, or even two sides of just one medal, but this did not only apply to German makers, or to pianos. If they didn’t have any medals, they sometimes designed their logo to look like one, as Laurinat did. Richard Lipp received lots of medals, but he was also on some of the judging panels for the exhibitions, as was Anton Bord, who boasted the fact on his pianos. What is clear is that some claims are misleading, and there are anomalies in the descriptions of medals and awards, often involving several different makers claiming the “Grand Prix” or "THE Gold Medal" or "Highest Award" at the same exhibition. The word "highest" may seem to imply that it is higher than anyone else's, but this is not always the case, and the highest award is usually a gold medal, sometimes awarded to a number of makers. Some names claiming medals are not even listed in the exhibition catalogues, and their claims seem spurious. 1798 The first Paris Exposition. 1819 Erard frères Gold Medal. 1823 Erard frères & Jean Henri Pape received Gold Medals. Petzold, Pfeiffer & Roller received Silver Medals. 1827 Erard & Pleyel received Gold Medals. Beckers & Bernhardt received Bronze Medals. 1834 Paris Exposition: Pleyel received a Gold Medal. Kriegelstein & Plantade received a silver medal. 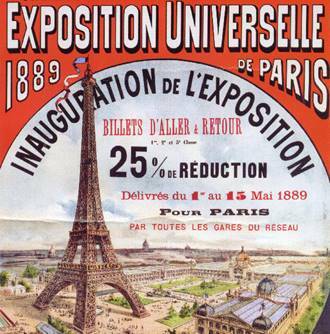 1836 Paris Exposition: Cluesman, Paris received a Gold medal. 1839 Paris Exposition: Pleyel received a Gold Medal. Pape showed his Piano Console, patented in 1837. Console Pianos which mention the exhibition were made after the event! 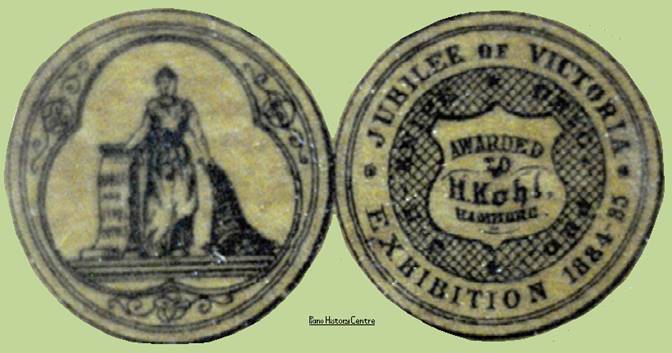 1841 Berden received a medal at an exhibition. 1844 Paris Exposition: Pleyel received a Gold Medal. De Rohden received a Silver Medal for pianoforte actions. 1847 Berden received a Gold Medal at an exhibition. 1849 Paris Exposition: Pleyel received the Hors de Concours. Mussard Freres received a bronze medal. 1851 Medal from the Exhibition Of The Works Of Industry Of All Nations, London, appears courtesy of Mary Thrower, and I scanned it from the medal itself. The original object was much bigger than the picture you see. This event was so much larger and grander than previous exhibitions, it soon became known as the GREAT exhibition, and was held at the purpose-built Crystal Palace. Erards confusingly claimed that theirs was “the only council medal for pianofortes”, but there were several others. 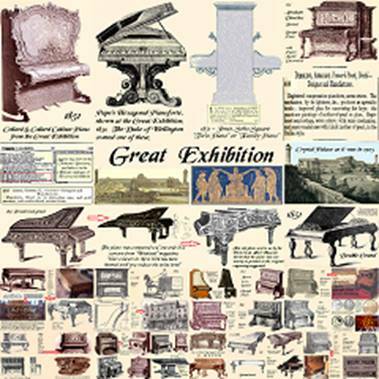 Some of the pianos shown in catalogues of the Great Exhibition. “Exhibition of the Industry of All Nations”. 1855 Erards received the highest award at the 1855 Paris Exposition. Gaveau received a Bronze medal. Rudd received a gold medal. Having received medals in 1851 and 1855, Erards produced commemorative discs which resemble small medals, but are easily spotted because they have both dates on them. Although interesting, these are not especially rare or valuable, they are thought to have been distributed to Erard dealers around the world, and stuck onto some Erard pianos. Other types would have a bolt sticking out of the back, for attachment to the woodwork. 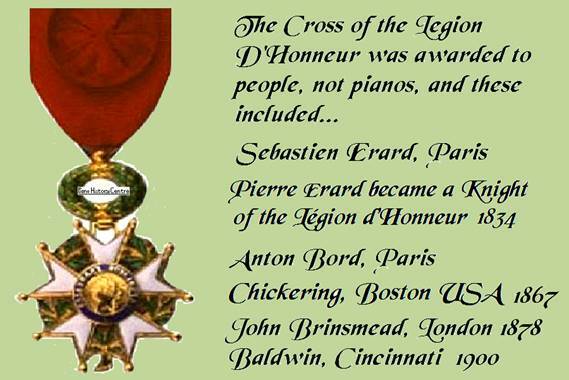 Berden, Pleyel and Hopkinson received medals, but we have no evidence so far that Erard was even there. Foster later claimed a medal as well, but so far, we have no evidence of the existence of a real maker of that name in London during the 1800s, and certainly no sign of him being there in 1862. Arthur Rosenstiel (London) also claimed a medal from 1862, but he was not listed as an exhibitor, indeed I can find no reference to the name in our many London lists of makers between 1862 and 1907, when the name was being used. William Crick’s pianos depicted a medal from the 1862 exhibition, but he is another one not listed in the catalogue as even being there, much less winning a medal. He also claimed Royal Letters Patent, but no evidence has been found to support this. Schiedmayer & Soehne received a medal at the Great Exhibition, 1851. 1865 Anglo-French Exhibition, Australia. Henry Brinsmead received a Gold Medal. 1867 Paris Exposition: Chickering’s literature implies that the Cross of the Legion D’Honneur was the highest award given to a piano manufacturer at this exhibition, superior to the Gold Medal, but in reality, the Cross was awarded to people, not pianofortes. At different times, these included Baldwin 1900, Bord, Brinsmead 1878, Chickering 1867, and Sebastian Erard. Pierre Erard became a Knight of the Legion D’Honneur in 1834. 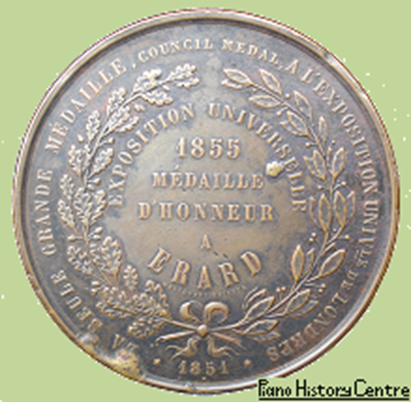 1867 Erard received a medal. Jules Rinaldi received an Honourable mention. Gaveau received a Silver Medal. Medals awarded to Alois Kern, Vienna, in 1867, 1870 and 1873. Medals from the Chile Exhibitions of 1873 and 1875 show these images of the goddess Minerva, easy to recognise if you can’t read the wording, so they would place a piano after the 1873 exhibition. 1878 Paris Exposition. Gaveau received a Gold Medal. Monington & Weston received a Gold Medal. Hopkinson received a Gold Medal. Charles Gehrling received a Silver Medal for Pianoforte Actions. 1879 Berlin Exhibition: "Dem Verdiensje Seine Krone" is a phrase to which non-piano references can be found from at least 1849 to 1903, the latter the title of a literary work: It means "The merits of his crown" but should perhaps translate more like "To the service of his crown", probably a bit like "By Royal appointment". The same phrase appears on exhibition medals awarded to Bergstein, Dietzer, Haller, Laurinat, Lubitz, Reisner, Schiemann, Schotz, Steinbeg & Weber, and these are mostly from the Berlin exhibition of 1879. That seems a lot of piano medals! 1880 Paris Exposition Universelle: Anton Bord’s pianos received a Gold Medal. Gehrling received a Gold Medal for piano actions. 1880 Melbourne exhibition. Fritz Kuhla’s pianos received a medal. 1881 Melbourne Exhibition. Can anyone tell me about a firm called Rose that received a gold medal there? which is odd because her Jubilee was not until 1887! 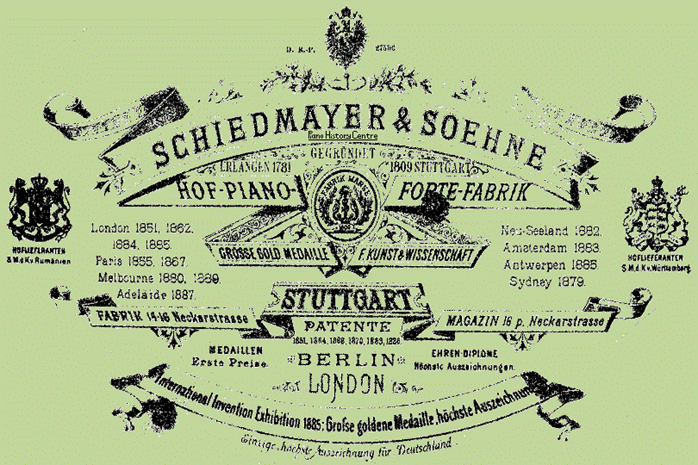 1885 Schwander received a medal for his piano actions. 1885 Arthur Allison's medal is attributed to the International Inventions & Music Exhibition 1885. This was possibly the same Inventions Exhibition at which Steinways won 2 gold medals. 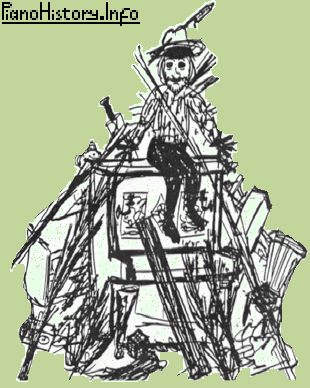 1885 J.D. Cuthbertson, Glasgow piano is also marked “G Klingmann & Co. Berlin”. It has small gold discs which read “Gold Medal Alexandra Palace and International Exhibition 1885”. 1885 Hopkinson received the Gold Medal at the London Inventions Exhibition. Chappell, Ajello & Allison also received prize medals. 1885 Robert Grout received an exhibition award for his pianos. 1885 Gold Medal awarded to G. Ajello at the International Inventions Exhibition. 1885 Squire & Longson Exhibition medal. 1885 Niedermayer received a medal at the International Inventions Exhibition. describing it as THE gold medal, in spite of all the others. 1887 Another International Inventions Exhibition was held in Sweden. and the Berlin Exhibition, 1896. Victorian Hopkinson pianos were “Awarded the First Class Prize Medals 1851, 1855, 1862, 1865 & 1872”. Single sides of 8 different medals awarded to Hopkinson up to 1910 are shown here. Among those, Hopkinson claimed to have received “the only Gold Medal for Great Britain” at the 1878 Paris Exposition, but Monington & Weston’s centenary leaflet proudly shows a picture of their upright which won "The" Gold Medal at the 1878 Paris Exposition! Barratt & Robinson received an honourable mention. It is odd that some of Hopkinsons’ pianos make no mention at all of the medals. 1887 Several jubilee exhibitions around Britain celebrated the 50th year of Queen Victoria's reign. and a reference to his Royal Appointment to the Princess of Wales. 1889 Gaveau received a Gold Medal at the Paris Exposition. Schwechten’s medals and awards up to 1891. Henry Hicks seems to have received 2 gold medals in London, in 1870 and 1899, but his name transfer and stationery do not give any real clues to the source of these, so they were probably minor local exhibitions. Pleyel’s medals up to 1887, from our 1892 Post Office London Directory. If a maker's other medals are listed in our files, then it may be possible to get some better estimate of the age of a pianoforte by finding out which medals are missing, because we have a tremendous amount of information about pianos in exhibitions. 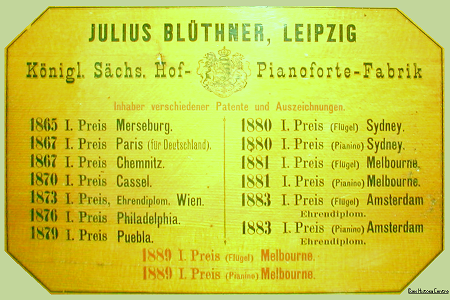 This list of Bluthner’s medals up to 1889 provides a means of checking the approximate date of a pre-1889 Bluthner piano, by seeing which medals are not shown. Here is a more complete list. 1880 1st prize, (flugel) Sydney. 1880 1st prize, (pianino) Sydney. 1881 1st prize, (flugel) Melbourne. 1881 1st prize, (pianino) Melbourne. 1883 1st prize, (flugel) Amsterdam. 1889 1st prize, (flugel) Melbourne. 1889 1st prize, (pianino) Melbourne. 1904 St. Louis Grand Prix. 1905 1st prize, Cape Town. If, for example, the label doesn’t show any medals after 1876, you can reasonably suppose that it was made after the 1876 exhibition, but before the 1878 exhibition. In reality, Bluthners are probably the least reliable example of this idea, because on occasions when they reconditioned their own pianos, they were one of the few makers that sometimes updated the list of medals. Emil Felumb’s medals 1881 to 1896. The undated one on the left is from Paris, possibly 1878. Both sides of J.L. Duysen’s 4 medals up to 1892. Henri Herz’s medals and awards. Around 1901-2, Osbert seems to have received medals from Berlin, Paris and Brussels. Our T.G. Payne piano shows both sides of a single medal from the Glasgow Exhibition, 1904. Georg Hoffmann, Berlin medals for 1902 and 1903, plus an anonymous single side. Strohmenger’s medals up to 1905. Almost anyone who sells second-hand postcards will have some from the Franco-British Exhibition of 1908, there is part of one at the top of this page, and their output of cards was enormous at a time when picture postcards were a fairly new idea, but we have found no details of the various pianofortes that claimed medals there, including Boyd, Diener, Gresham, Mozart, Rudall Carte, Thalberg, and Vader. 28 medals and prizes awarded to Gaveau, Paris, up to 1913. Berdux, Munich, received these 9 medals up to 1911. 1946 “Britain can make it” Exhibition. Imagine, you are offering a piano for display, to represent the best that Britain can make, and Monington & Weston exhibited this bog-standard grand mounted on the kind of unfinished legs that were used on coffee tables, but bigger. Monington & Weston’s stand at the 1951 British Industries Fair. I worked on similar stands at the Ideal Home Exhibition for Berry Pianos in the sixties. Without donations, I will be fine, but our collection may not survive. If every visitor to this site made a donation, our museum building would have much better displays, and much-improved facilities for research within our own archives.